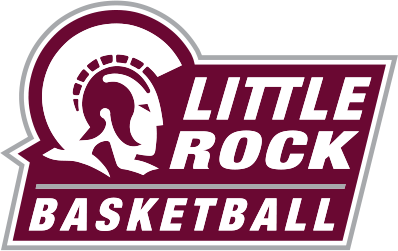 Last night, Little Rock (LR) men’s and women’s basketball hosted Coastal Carolina at the Jack Stephens Center in games which saw the women win 53-44 and the men fall 65-60. LR’s star forward Ronjanae DeGray started the game’s scoring after Monique Townson turned a steal into an assisted hoop by DeGray. LR jumped out to an early 8-2 lead, then outscored the Chanticleers 16-7 in the second period to take a 26-19 lead into halftime. DeGray started the scoring in the second half also, and a 14-4 run by the Trojans gave them a 17-point lead, their biggest lead of the night, with the score at 40-23. They led 41-31 entering the fourth quarter. The Chanticleers hit a three to open up the final period and cut the lead down to seven, at 41-34. Fortunately for LR, that was as close as Coastal Carolina would get. The Trojans protected the ball, rebounded, and hit key shots when needed to seal the 53-44 victory, and improve their conference standing to 14-1. DeGray was named the player of the game, finishing with 14 points, six rebounds, and two steals in 38 minutes. Townson, who also played 38 minutes, led all players with seven assists while contributing thirteen points, five boards, and two steals. Keanna Keys made plenty of big buckets and defensive stops on her way to a 15 point, four rebounds, and one steal effort on the night. The men’s game started off slow, with both teams committing a lot of early fouls. Both teams were shooting in the bonus by the seven-minute mark in the first half. The slow pace picked up as halftime approached. The Chanticleers took a 31-23 lead into halftime. The Trojans started to find their stroke behind the three-point arc in the second half, hitting five of its 12 attempts. After an “And 1” by junior forward Ben Marcus and a subsequent three-pointer by Cameron Reedus cut the Coastal Carolina lead down to just two, 39-37, it looked as if the Trojans were about to take the momentum. Instead, Coastal Carolina answered with a three of its own and pushed the lead to 42-37. That was as close as LR would get. Good free throw shooting by the Chanticleers secured a 65-60 win. The loss took the Trojans to 3-11 in the conference and 6-21 on the season. Ben Marcus set career highs in points and rebounds, 17 and 11, respectively; his best game of the season statistically. Guards Anthony Black and Cameron Corcoran both had 11 points. Junior guard Cameron Reedus pitched in with eight points. Free throw shooting again hurt LR in this one. The team shot a combined 50%, going 11 of 22. They are shooting 62% on the season. Little Rock hosts Appalachian State at the Jack Stephens Center on Saturday. The women tip off at 3 p.m. and the men follow at 5 p.m. It is both programs’ final home game before traveling to Louisiana to finish out the regular season.